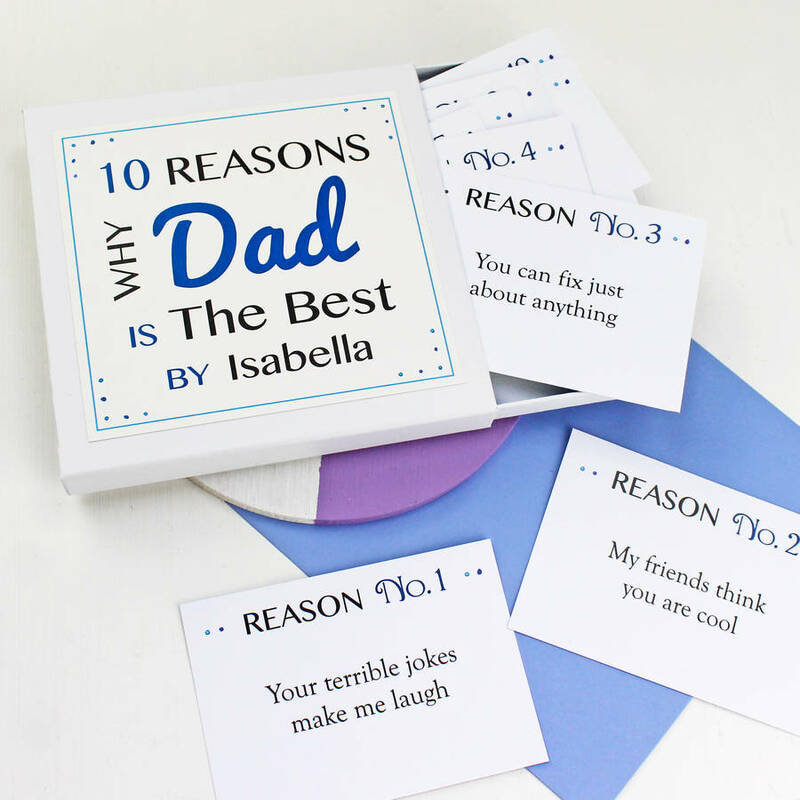 Tell your Dad why he is the best with this delightful box of personalised best Dad notes. A gorgeous gift from children (big or small!) 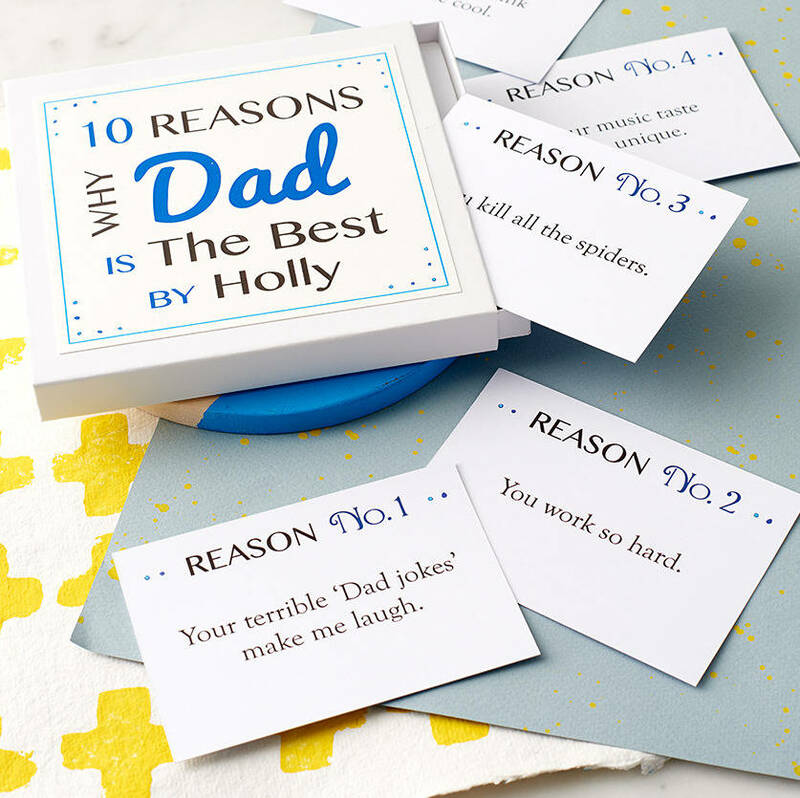 for a birthday or Father's Day, that your Dad is bound to treasure. 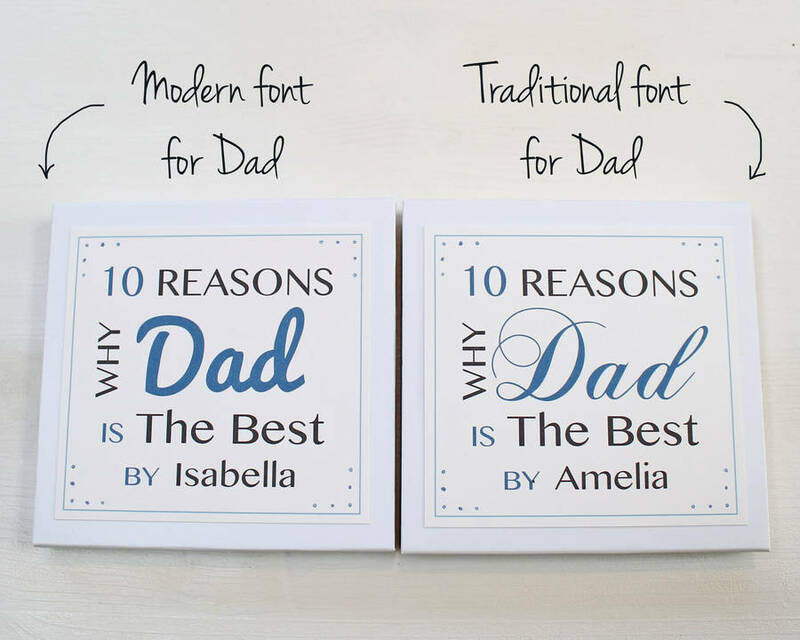 You can choose from either 10 or 20 little note cards; both are packed in a personalised high quality white or natural-coloured presentation box. 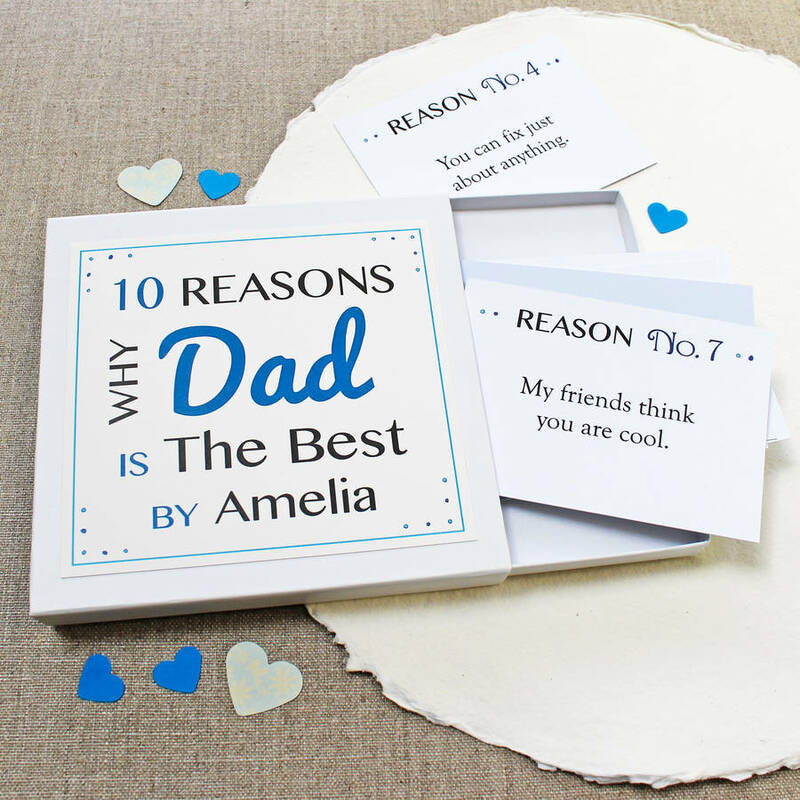 This presentation box is personalised with the name of who the notes are from (eg you or your family), and what you want your dad to be (amazing, brilliant or the best). 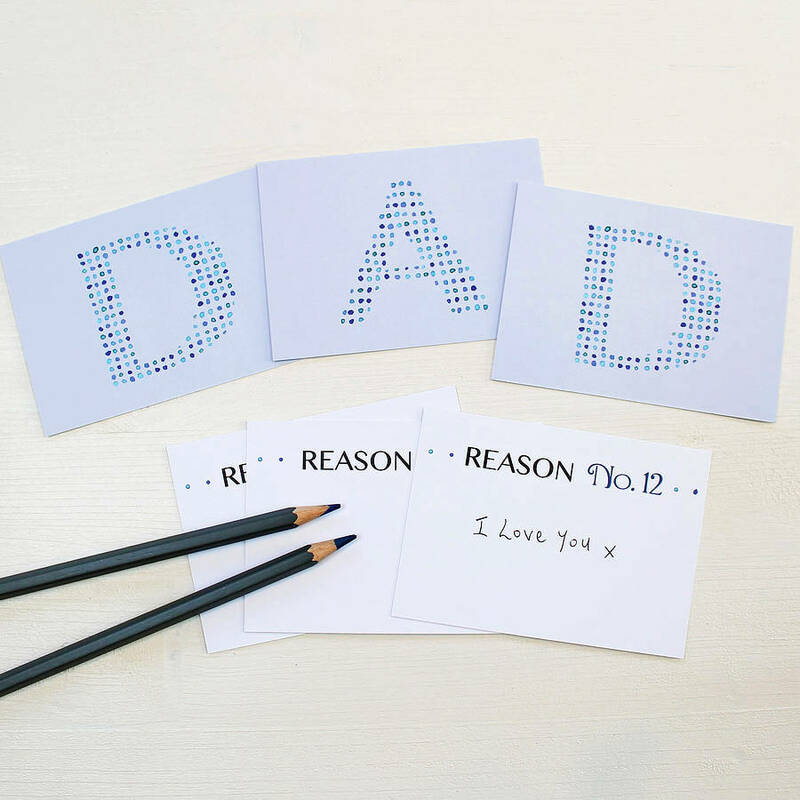 Inside, each little note card captures a reason why your dad means so much. 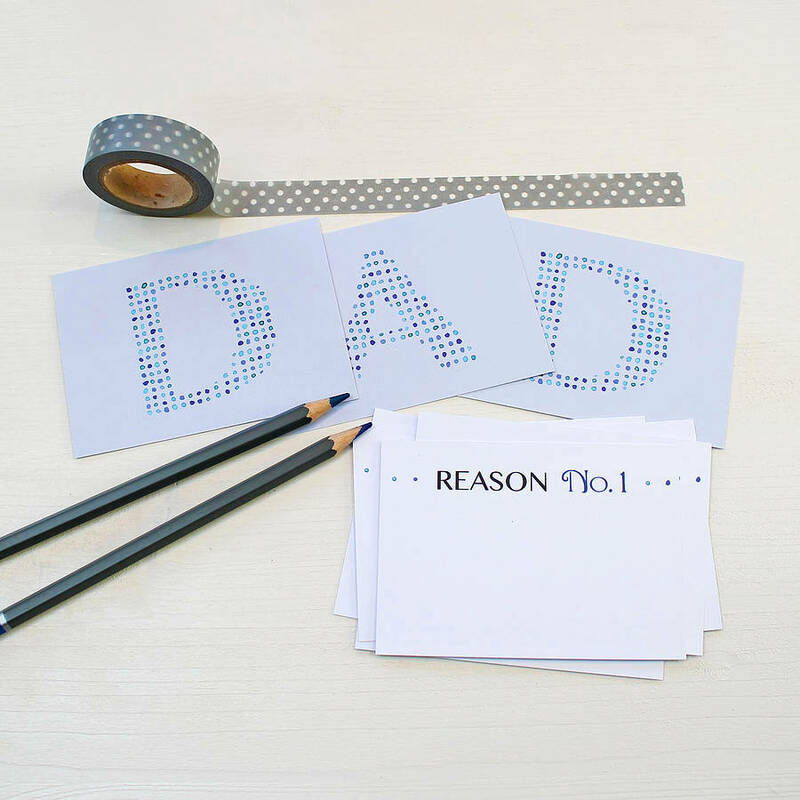 You can choose whether you’d like us to print your reasons on the note cards, or have them blank so you can write on them yourself. If you’d like us to print them for you, feel free to add any lovely personal thoughts or memories. You encourage me to be the best I can be. My friends think you are cool. Your terrible dad jokes make me laugh. You kill all the spiders! You can fix just about anything. You know so many random facts. Your dancing is from another planet. You took me to my first football match. You taught me to ride a bike. You take me on amazing adventures. You introduced me to music. You will always be my daddy. 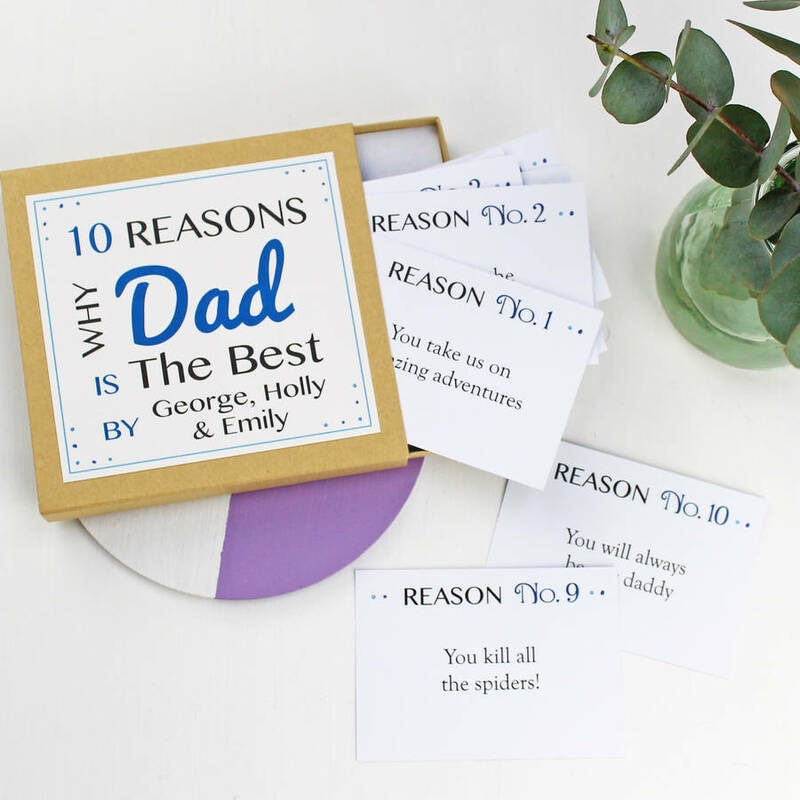 This charming box of personalised best dad notes have been lovingly made in Britain from original hand-painted watercolour and ink artwork. 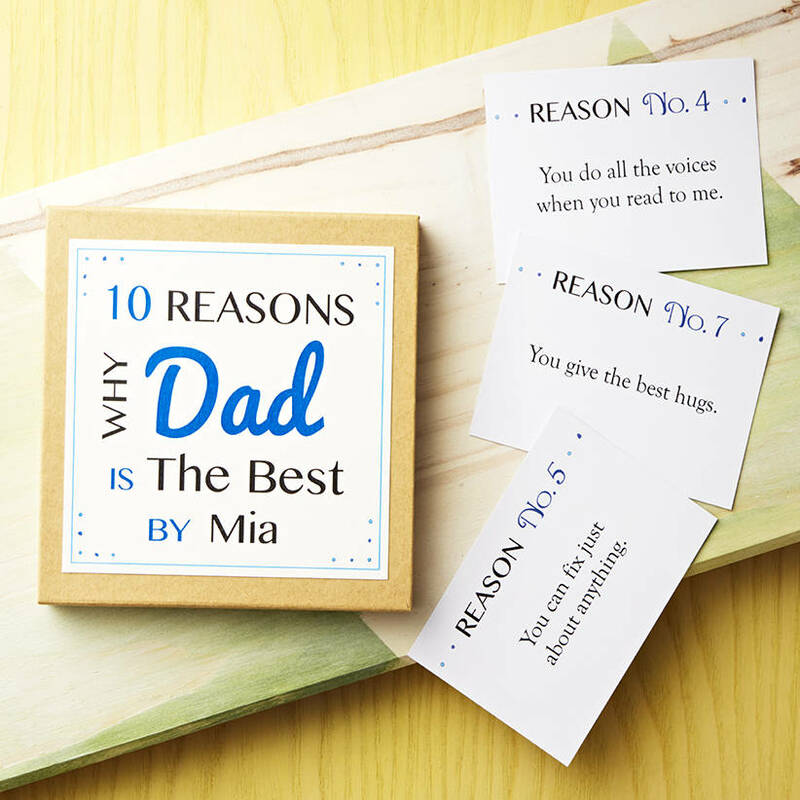 The note cards are printed on high quality thick card and are packaged in a luxury white or natural-coloured presentation box. To ensure we are doing our bit for the environment, the box is made from fully recycled card and the note card is sourced from sustainable forests. 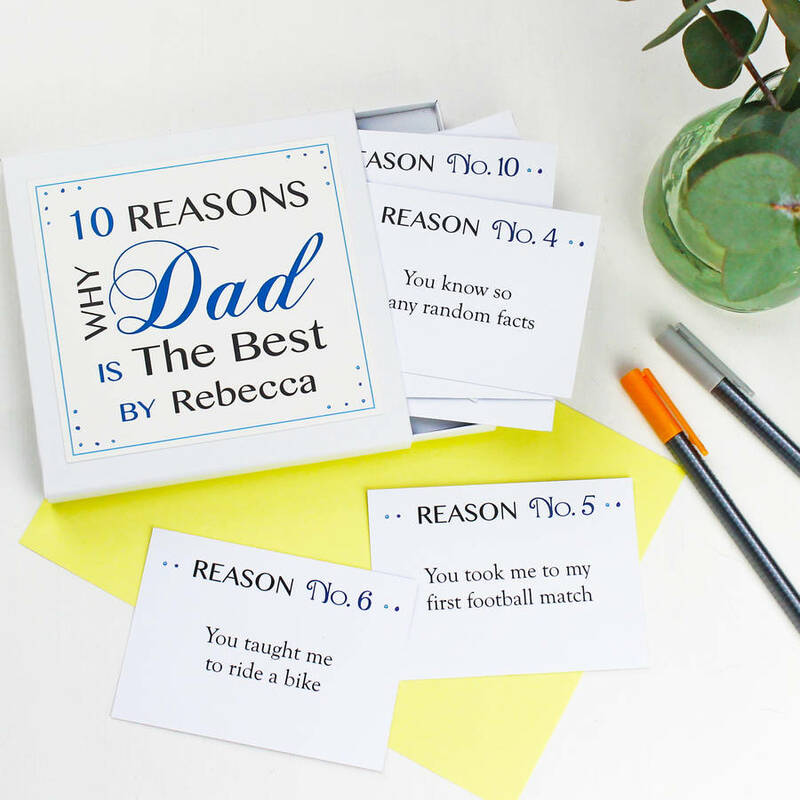 Please note: we will print your reasons exactly as you input them (as often they are personal!) so please make sure you double check any personalised text including spelling before ordering. For particularly long reasons we may need to make the text smaller to ensure it still fits nicely on the cards! The note cards are approximately 7.4cm x 10.5cm in size and the presentation box measures 13.5cm x 13.5cm. Standard delivery is by Royal Mail first class post. We will ensure we dispatch your order by 2 days before the estimated delivery date, but please note this date is estimated and while we always do our utmost to ensure your order reaches you within the stated delivery times, there may be rare occasions where factors outside our control can affect these times, such as Royal Mail delays. For a guarenteed delivery service, we also offer a tracked Express Next Day Delivery option. If you have already ordered, please contact us if you want to upgrade to this delivery service. 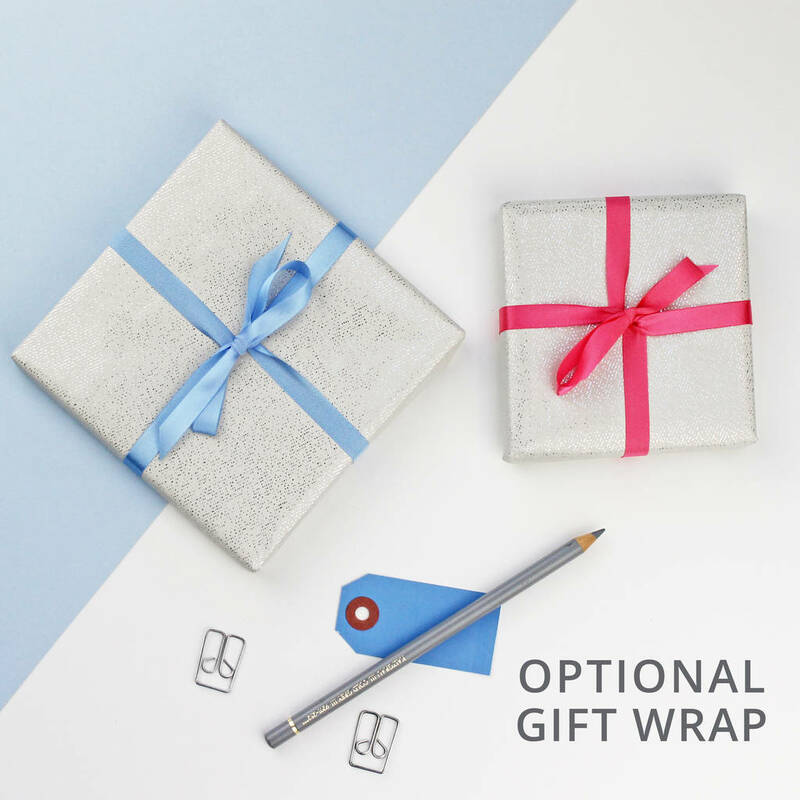 You can send direct to the recipient by adding a gift message at checkout, which we'll attach on a gift tag to your wrapped order.